The Pope Is An Anti-Christ? 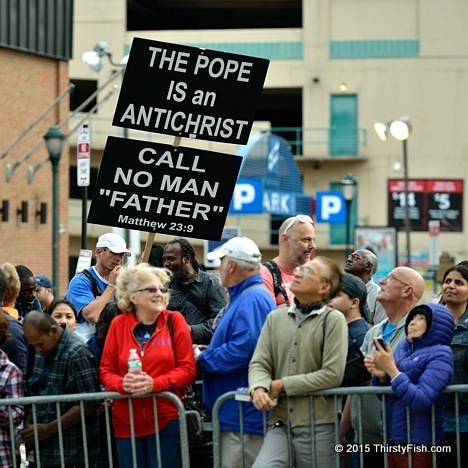 Pope Francis' Philadelphia visit also drew a fair amount of hate speech. It's one thing quoting the Bible to stress your differences - Matthew 23:9 "And do not call anyone on earth your father; for One is your Father, He who is in heaven" - it's another thing calling The Pope an Antichrist. Sacerdotalism is the belief that propitiation requires the intervention of a priest. Roman Catholics and Protestants differ in that Protestant denominations reject sacerdotalism. Free of established religious affiliations, I mostly hold panentheistic views, and as such, I'm with the Protestants on this one: I too reject sacerdotalism. That said, the inclusive message of Pope Francis resonates with many, while those who harass crowds with their hate speech simply don't get it. I guess they forget about the numerous Bible passages shunning hatred. Or passages about judging others: Matthew 7:1 "Do not judge, or you too will be judged". Someone tried to explain to me that signs like this do not qualify as hate speech. Well how about yelling to crowds waiting in line to see the Pope that they are all hell-bound? Or, telling crowds that, "Your Mother Teresa is burning in Hell right now". Wouldn't that qualify as being ignorant of your own hatred?